In the Natural Park of Serra de Aire e Candeeiros and 60 minutes from Lisbon! 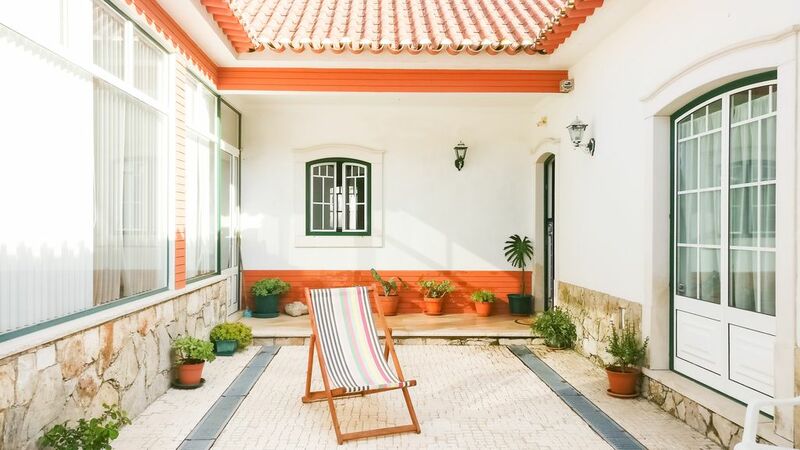 The local lodging house Pátio D'Aldeia is in the village of Alcobertas in the Natural Park of Serra de Aire e Candeeiros and 60 minutes from Lisbon! With a vast cultural and landscape heritage to explore, the space is great for families or groups of friends who like to enjoy and discover nature. Book it now! The location and its surrounding heritage provide the conditions for a unique and diverse experience in nature and with the possibility of exploring the nearby towns. - Potential for the practice of nature sports (mountains, forests, ponds, rivers, caves, geological formations, castles). It is 10km from the city of Rio Maior with the Salinas without the sea and the municipal swimming pools; 30 / 40km from the Atlantic Ocean, beaches of Nazaré, São Martinho do Porto, Foz do Arelho, Baleal and Peniche; near the cities of Alcobaça, Caldas da Rainha, Óbidos, Santarém, Batalha, Tomar and Fatima. Living in Lisbon for the past 5 years but coming to my hometown very often - Alcobertas, Rio Maior - where I have a house to host people that love nature! I already visited Belgium, Iran, France, Belarus, Spain, Romania, Ireland, Poland, England, Slovakia, Netherlands and Slovenia. The place is unique because of the interior courtyard, a very nice fireplace and mini bar with liqueurs on the living room accompanied by smooth music! verde del parco al mare di Nazare' e delle città d'arte dei dintorni, la casa era pulita e piacevole da abitare. Thank you Claudio for staying at hour house! Was a pleasure to welcome you. Thank you for your kind words about the house and location. We are fortunate to have a house in the nature but also close to important historic cities to visit. Thank you so much and hope to welcome you again in the future. Nous avons été très bien accueilli. La maison offre tout les équipements nécessaire. Il manque la climatisation et c'est assez bruyant mais tout le reste est parfait. Nous avons été heureux de rencontrer le papa de Pedro qui est adorable et Pedro à été très prevenant par téléphone . Merci pour tout!! Thank you Eva for your nice words about our hospitality and the way the house is equiped, we feel very happy to hear it! We sorry if you had some noise problems because it's not normal. Hope we can see you again in the future! La casa acogedora y tal como se ve en las fotografías, una zona muy tranquila pero a la vez relativamente cerca de Lisbóa, otras poblaciones de interés. Pedro Allfonso y su padre , en todo momento nos facilitaron la estancia y nos hicieron sentir en todo momento muy bien acogidos. Gracias Teresa por tus amables palabras sobre la casa. Es genial escuchar que lo encontraste cómodo y en una muy buena ubicación, cerca de importantes ciudades históricas. Estaremos muy contentos de recibirlo de nuevo en el futuro. ¡Te deseo lo mejor! Séjour de 12 jours, reçu de manière adorable par Pedro et son père Fernando. Les photos sont tout à fait conformes à la réalité et la maison très spacieuse, très agréable à vivre. Nos hôtes ont été charmants en tous points, et attentifs à nos éventuelles questions. Un lugar muy acogedor y tranquilo! Ideal para descansar de la rutina. Isabel and his family were amazing and very friendly! It's an excellent group to host. In the end, they left the house very clean. I recommend them with no doubts and will also be a pleasure to host them again in the future! Pedro's house is located in Alcobertas, Santarém, Portugal. This locality belongs to the Natural Park of the Sierra de Aire and Candeeiros.